The crises of climate change and ecosystem disruption are true planetary emergencies. Given the magnitude of these problems (and many others), old thinking will not be enough. Only bold new approaches will suffice. This wonderful book proposes a new framing that provides some questions that we need to ask—and some answers that may be the ones we need. It is not surprising that such new ideas would come from Cameron La Follette and Chris Maser. Nearly 40 years ago, Chris Maser (a Bureau of Land Management wildlife biologist at that time) helped open my eyes at a week-long "short course" in the ecology of old-growth (ancient) forests. The course was held at the H.J. Andrews Experimental Forest in the summer of 1978. He and other scientists associated with Oregon State University's Department of Forestry had started to untangle the puzzles of the ancient forests, which the timber industry viewed as simply a source to be exploited and which the industry called a "biological desert." Maser and his colleagues showed this was far from the truth. A few months later, the Lane County Audubon Society organized a series of evening lectures on the ecology of old-growth forests. One of those lecturing was a college student named Cameron La Follette, wise beyond her years, who was in the process of publishing a small book titled "Saving All the Pieces: Old Growth Forest in Oregon." She pointed out that the "first rule of intelligent tinkering is saving all the pieces," a paraphrase of the advice of conservationist Aldo Leopold. Cameron later went to law school, but decided to devote her life to other ways of saving all the pieces. Cameron and Chris have long challenged us to think in new ways. This book is their latest effort, and it is one of stunning scope. Both of them have always exhibited passionate creativity. Their thinking was indispensable to the reframing of lawsuits and politics that led to new visions of the disappearing ancient forests of the Pacific Northwest of the United States. They are now embarking on a new journey with this book—one that asks us to redesign legal approaches and reimagine the tools that we need to craft solutions. The heart of their vision involves ecosystem rights—rights for Nature itself. In recent years, the linkages between human rights and environmental protection have been increasingly recognized around the world. Over 100 countries have embedded a right to a safe and health environment in their national constitutions—as have five states of the U.S. in their state constitutions. Books, articles, and journals are being published on "human rights and the environment." The organization that I co-founded, the Environmental Law Alliance Worldwide, has lawyers in countries all around the world who litigate and advocate on behalf of human environmental rights. But Chris and Cameron ask us to look beyond "human" rights. They ask us to look even more deeply at nature, ecology, and law. Laws in numerous countries and international agreements have evolved to give citizens the right to file lawsuits against government bodies or polluters for causing environmental harm. United States laws since 1970 have provided for "citizen suits" in the fields of air pollution, water pollution, endangered species, and many other areas. In Europe, the Aarhus Public Participation Convention, now nearly 20 years old, states explicitly that a right to a healthy environment exists and requires that the 45 countries that have ratified or acceded to it must open their courts to citizen groups that are defending the environment, without having to prove an economic or personal interest will be affected before suing. Various experts have talked about "legal standing" in court for natural places, about the glacial pace of environmental regulation, about the difficulty of getting political bodies to react with urgency to the loss of biodiversity and the looming tragedy of global warming. What La Follette and Maser do in this exciting book is to bring these problems together in a new synthesis and to describe a radically new solution that is already forming in a few scattered countries and cities—recognizing that Nature itself could have legal rights. They also demand a radical (that is, fundamental) understanding of true "sustainability"—not as a political or economic magic phrase, but as a truly ecological concept. They take their vision and work through its implications in a multitude of contexts. One need not subscribe to every argument they offer in this book. But one cannot read this book without opening one's eyes to new insights and new possibilities. When the Universal Declaration of Human Rights of 1948 was drafted, there was little thought that it would apply to issues of clean water, clean air, and other environmental matters. Yet decisions of the European Court of Human Rights, Inter-American Court of Human Rights, and other bodies have interpreted older human-rights language to extend to environmental rights for human beings. Who is to say that this process is complete—or that it must stop with "human" rights? Reading this book will raise new questions. Will Nature's own rights—to be free from excessive and debilitating human contamination and pollution, for example—be next in the evolution of ideas? Is it possible to create a legal and sustainable order in which Nature can continue its own natural processes without its protectors being restricted to narrow, 17th- or even 20th-century conceptions? If Nature's rights are to be recognized, who would have the status to defend Nature's rights in courts or other bodies? Will it be government entities, conservation groups, or individuals? Will development in law and consciousness be limited to litigation in the courts set in place, or will there arise something new, like Nature Tribunals? And who will be the lawyers, scientists, politicians, and citizens who drive us toward a new generation of rights? Read, admire, argue, challenge, and enjoy this statement of a new vision for Earth. And, consider ways to make this kind of vision real. The life of Planet Earth depends upon new thinking, such as this. POPE FRANCIS SPEAKS FOR THE EARTH: THE ENCYCLICAL LAUDATO SI. THE MISUNDERSTOOD PRIVILEGE OF LAND AND RESOURCE "OWNERSHIP"
DESIGN OF THE LEGAL SYSTEM: REGULATORY OR MARKET-BASED? How Does Nature Have Rights? BIOMIMICRY AND TECHNOLOGY-ARE THEY COMPATIBLE WITH NATURE'S RIGHTS? Restoration of Wetlands: What Does It Mean in Practice? Still Wetlands Disappear and Are Degraded: What Can Be Done? 2. Klamath Basin: The "Everglades of the West"
The World Bank: Example of International Corporate "Legal Rights"
We humbly dedicate this book to Ecuador, Bolivia, and their indigenous peoples. Building on their indigenous philosophies, these countries, with foresight and courage, have led the world being first to place the Rights of Nature in their legal systems. They are the pioneers in creating environmental sustainability for all generations. In reading this book, keep in mind that our earthscape is composed of three interactive spheres: the atmosphere (air), the litho-hydrosphere (the rock that constitutes the restless continents and the water that surrounds them), and the biosphere (the life forms that exist within and between the other two spheres). We humans have, however, arbitrarily delineated our seamless world into discrete ecosystems since the advent of agriculture, as we try to control—"manage"—the fluid interactions among the nonliving and living components of planet Earth for our material benefits. If you picture the interconnectivity of the three spheres as being analogous to the motion of a filled waterbed, you will see how patently impossible such divisions are because you cannot touch any part of a filled waterbed without affecting the whole of it. Together, these three spheres form myriad interactive, self-reinforcing feedback loops that affect all life on Earth. It is the degree to which we humans either honor or defy the reciprocity of these feedback loops that form the legacy we leave—one that either liberates or progressively impoverishes all generations. The choice of how we, today's adults, behave is ours—either with psychological maturity and our respectful treatment of Nature through sacred humility or continued self-indulgence through unbridled materialism, profit seeking, and their ensuing environmental violence. Where in the United States today are there unequivocal voices that speak for protecting the sustainability and productive capacity of Nature, as our bequest to all children—present and future? Without such voices of consciousness, courage, and unconditional commitment to the Rights of Nature through the present into the future in all ranks of leadership, we, the adults, are increasingly condemning our children, grandchildren—and every generation yet unborn—to pay a progressively awful price rather than accept the sometimes-difficult choices of our adult responsibilities, as trustees of our home planet's social-environmental integrity. The psychologically maturity choice to become a truly peaceful society for the rest of the world to emulate requires that we, in the United States, transcend the environmental violence of our often-declared "war" on Nature. To rise above this violence, we must focus first and foremost on the "Rights of Nature" by accepting and honoring Nature's Laws of Reciprocity with total dedication and persistence in our economic/political/legal systems and our common social systems. Peace will reign only when there is no longer any thought of abusing Nature for personal gain. But, to eliminate this linear, economically oriented mentality, its environmental violence, and its intentional overexploitation of dwindling resources, we must shift the economic/political/legal systems from their current focus on acquiring money and power to a single, integrated, social-environmental system that fully protects and prioritizes Nature's right to flourish as a living entity. Finally, this CRC series of books on the various facets social-environmental sustainability is a forum wherein those who dare to seek harmony and wholeness can struggle to integrate disciplines and balance the material world with the spiritual, the scientific with the social, and in so doing expose their vulnerabilities, human frailties, and hope, as well as the wisdom of their visions for a viable future. "Sustainability and the Rights of Nature: An Introduction is a much needed guide that addresses the exciting and significant paradigm shift to the Rights of Nature, as it is occurring both in the United States and internationally in the fields of environmental law and environmental sustainability. This shift advocates building a relationship of integrity and reciprocity with the planet by placing Nature in the forefront of our rights-based legal systems. The authors discuss means of achieving this by laying out Nature's Laws of Reciprocity and providing a roadmap of the strategies and directions needed to create a Rights of Nature-oriented legal system that will shape and maintain human activities in an environmentally sustainable manner. This work is enriched with an array of unique and relevant points of reference, such as the feudal notions of obligation, principles of traditional indigenous cultivation, the Pope Francis Encyclical on the environment, and the new Rights of Nature-based legal systems of Ecuador and Bolivia that can serve as prototypes for the United States and other countries around the world to help ensure a future of environmental sustainability for all living systems." "As an avid reader, now in my seventies, I have found that only about twice a decade a book comes along that challenges the foundation of what I know and provokes me to think afresh. 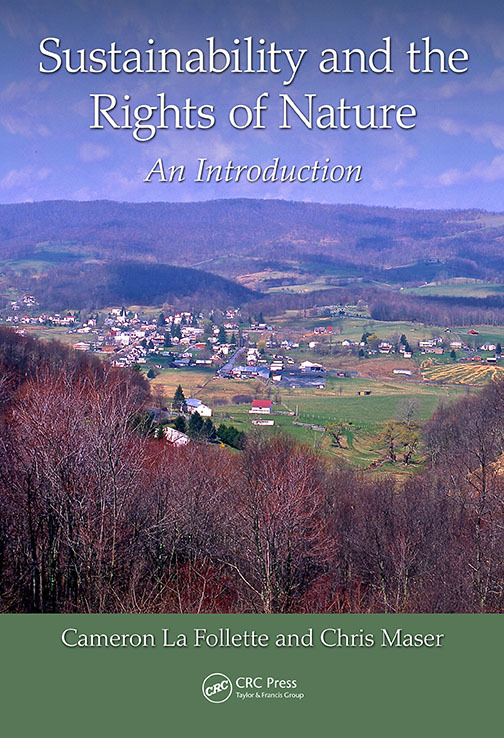 'The Rights of Nature' is such a book. La Follette and Maser have used the lens of systems theory to capture the history, ecology, geography, technologies, laws, and politics, as well as challenges and solutions, to the relationships of people to the planet. The book consolidates the complex dimensions of human and natural systems to support a paradigm shift, which embeds the Rights of Nature in national and state constitutions, to create the essential reciprocity between people and the planet. "Systems theory, which is about understanding relationships among 'things'—not the things themselves—grew out of the theories of Ludwig Von Bertalanffy, George Miller, Kenneth Boulder, and others, surrounding World War II. As a self-described 'systems wonk,' it was heartening to me to find a book that offers system concepts in the 15 'Laws of Reciprocity.' These laws remind us that everything is related to everything else, and that one can not only analyze and explain systems relationships but also geometrically expand the understanding of problems, and hence, solutions. If one thinks that problems are unidimensional, then one proposes a single 'silver-bullet' solution, and often causes yet another problem or problems. The authors' approach reminds us that not only is there complexity in the system but also cumulative effects over time, which are understandable, if we think systemically. "For all of their concern about the environment, La Follette and Maser are not anti-people; indeed, they recognize, honor, and incorporate people into their analyses, recognizing that ultimately it will be people who create the change that leads to a harmonious relationship with the planet. The authors are clear that we are locked with nature toward a future in a reciprocal relationship, a species with rapidly increasing brawn now needing sufficient brain to understand who we are and what we do to our essential partner. While other species have created massive die-offs and changes in natural systems, we are the first species that has created the very-real risk of making our planet uninhabitable. "Change in systems can be slow in terms of a human life, but very rapid in terms of historic time. Through my own training in landscape architecture and natural resource management, I've often wondered what part of this planet we will leave untouched. My landscape-architecture training, in the 1960s, valued nature only as a substrate to grow ornamental plants; there was little concern for wildlife (even bees and birds), much less for soil or water. That profession, and many others in natural resources, has grown much over the past 50-plus years, and now there are green roofs, bio-swales, native plants, and home landscapes planted for wildlife. There are a host of environmental regulations at both national and state levels to protect the environment. In natural resource management, there is far more concern for sustainability with its myriad meanings than there is for nature as a 'resource' having its own intrinsic value. "Although change within professions, institutions, and cultures is slow, I would argue that it is inexorable. Embedded in the 15 'Laws of Reciprocity' is the reality that human systems do not like change unless it is safe, incremental, and rewarding, but change is happening nevertheless. There are always people who push the frontier of what we know and do, who define new values and ways of achieving those values. "The incorporation of Rights of Nature into national and state constitutions has already begun. The authors review in detail how Ecuador and Bolivia have made this change, and how the United Nations and other entities have entered the discussion, providing both hope and incentive to continue the effort. The authors have, in what must be a unique synthesis of the literature, pulled together in their 'endnotes' the diversity of efforts occurring on the planet, providing a comprehensive and integrated review for anyone working on a specific issue or cluster of issues. "For those who wish to sustain the status quo, La Follete and Maser are dangerous: They propose the kind of fundamental change that will upset disciplines, corporations, organizations, institutions, and people who benefit from current circumstances. They are not bound by an orthodoxy and doing what has always been done. While I would not agree with all statements they make or solutions they offer, I appreciate the opening of a much broader and deeper discussion of the relationships between people and the planet. "I agree whole-heartedly with their concern for Indigenous peoples and their Native ways. From my own years in Alaska, teaching co-management of natural resources, I know that the loss of Native ways, including their languages, leaves the world poorer for ideas about how we might fashion a new relationship between Western culture and the planet. This is no small matter, because how we think and how we assign value defines how we act; if the environment is made up of resources without souls or purpose other than those we give it, there is little room for the new thinking and new ways. "The book is not simple, but La Follete and Maser use a five-part structure to move the reader carefully through the 16 chapters. Part I addresses the systems theory, the Laws of Reciprocity foundation of their logic, and the emerging legal paradigm centered in Ecuador and Brazil. Part II concerns building blocks for rights of nature system, such as private-land ownership. Part III describes stumbling blocks, notably a diverse array of technologies and one of the most challenging—corporations. Part IV shifts into possible solutions in application of Rights of Nature for land, water, and air, whereas Part V adds discussions of food supply, energy, mining/drilling, and trade. "Parts IV and V are particularly rich for their discussion of 'management considerations,' what is working now or could work. Each chapter concludes with scores of references that make the book the center of a much greater worldwide discussion. Here, the professor in me wants students to pick one of the dozens of subjects and grapple with issues and solutions, to go beyond doing what society, or their profession does now, but looking toward what is possible tomorrow. Indeed, I would want students to look back 50 years to what was, and then look forward 50 years to what could be. I would ask them to use this book to be part of the paradigm shift that La Follete and Maser imagine. "The health of the planet has never been as threatened as it is now, largely by new technologies distributed by larger-than-government corporations. 'Modernity,' with all of its products, expectations, and values is changing and spreading with unimaginable speed. Such rapid change has become the norm and is threatening many, if not most, people and societies, promoting often dramatic and hostile feedback from those who feel threatened, left aside, or who cannot compete. There is tremendous pressure for countries, religions, and more broadly cultures, to accept the Western paradigm to develop their natural world in Western ways. Yet, to do so may be to come onboard a sinking ship. There are no easy answers, but there needs to be an in-depth and fact-based discussion. This book serves to both initiate and support that discussion. "Good books are provocative and often require several readings. Sometimes they are 'right on' and fit our personal views, while other times they can be annoying or feel mistaken or biased, but often on a second or later pass they make sense, good sense. As an academic and practitioner who feels proud to be shunned by both 'deep' environmentalists and aggressive 'developmentalists,' this book is refreshing, but not easy: the simile that comes to mind is of diving into a cold mountain lake—awakening, something you don't forget, something that helps you find feelings and senses that have become dormant. As much as the problems feel overwhelming and apocalyptic, on one hand, so the solutions, including those the authors point out have already happened, encourage us not to despair, on the other. Where Aldo Leopold and Rachel Carson helped me to a greater appreciation of nature over 50 years ago, La Follette and Maser help me to think about that nature with new insight, information, and hope today. "We are, as noted, the one species that can destroy itself and all others. We are a young species that, by one definition, is only recently conscious. I would argue that most of what we think and do is rote, stamped into our right brains by our culture through our parents, religion, and social norms. We learn a way of thinking that makes response easy, but unreflective and often wrong. It is heartening to see Pope Francis mentioned as a proponent of what this book is about. It also gives me hope to know that some corporations are seeing the inevitable—we need to go beyond who we have been and how we think about nature to who we can be. We need to know our limits and ourselves. Perhaps most importantly, we need to get past what the authors call our 'self-righteous arrogance.' And, we need the planet to hang with us a little longer while we grow the humility to become part of long-lived and diverse ecosystems, rather than the invasive species we are today. "Looking back over my lifetime, I can see clearly that there has been a paradigm shift in our culture and our society, but it is not enough. Now, on what corporations would call a 'just in time basis,' arrives La Follette's and Maser's book, providing a summary of where we've been, guidance on where we need to go, and how to get there. I heartily recommend this book for concerned citizens and students. In addition, having served as the director of a division of a family foundation, I strongly encourage leaders of corporations, foundations, universities, and organizations to read this book and reflect on their own orthodoxy and whether they represent an obstacle to change or are open to developing a reciprocal relation with nature. "One of my favorite sayings is: We all live in an economy; we all live in a community, and we all live in a watershed. These three systems form, for me, a Venn diagram of overlapping circles, each with its own interior relationships and each with relationships to other circles. La Follette and Maser have described the nature of these relationships, providing a 'go to' book for understanding, planning, and action. In the conclusion, the authors review doomsday scenarios that have been written, but they end on a strong note of hope, that 'courage and altruism are two indomitable human traits that will lead us to repair … severed relationships with courage, responsibility, and a deep commitment for one another and all life.' Amen." "In following the work of Chris Maser since the late 1980's, I see that he is continuing to produce timely publications of crucial information needed by organizations, institutions, and communities facing choices between natural resource sustainability and the path of further destruction of the planet's life-support systems. This new book provides ecological, historical, legal, and contextual information about the wide range of seemingly insurmountable challenges we face around the planet. Thankfully, along with in-depth analyses of the problems and causes, the recommended solutions seem attainable. The lists of specific recommendations for management, restoration, research, and governance, all emphasize justice. Indeed, 'The Rights of Nature,' as an overarching framework for choice-making at all levels of governance, from personal to global, is a greatly needed manifesto." "In Sustainability the Rights of Nature: an Introduction, La Follette and Maser dramatically outline what is at stake if we continue current environmental policies and what approaches are necessary to improve the sustainability of our global lifeboat. Both authors have been involved in legal and political actions to protect forests and fisheries that steered environmental policies in new directions in the Pacific Northwest. "Protecting the sustainability of natural resources is not optional. Human survival depends on not fouling our environment or depleting our resources. The authors use new constitutions from Ecuador and Bolivia as examples of legal recognition of Nature's 'rights.' Although this seems like a child giving its parents the right to be parents, everyone needs to be concerned about the sustainability of ecosystem services on which our survival depends. Humans have a carrying capacity, just as do all other forms of life. The Common Heritage Principle is described as a useful platform for protecting ecosystems that support all our needs for food and fresh water, but this principle is useless unless it can be enforced against politicians and global corporations that exploit for personal gain, regardless of the consequences for the rest of humanity. The political and economic leaders responsible for exploitative environmental policies typically do not live or drink water, where their activities maintain social inequity. Human rights and environmental protection are inextricably linked. "The authors emphasize that humans cannot destroy Nature but can induce changes that make the world inhospitable to humans. This has happened before. Although drought is recognized as the proximal cause of the collapse of Maya and Mesopotamian cultures, accumulating evidence indicates that those droughts were exacerbated 2-3-fold by massive deforestation and agricultural intensification that resulted in desertification of previously productive regions and reduced surviving Maya to hunter-gatherer groups. Those changes occurred over hundreds of years; longer than the U.S. has been colonized. We are changing our environment much more rapidly than did the Maya or Mesopotamians. Large areas of cropland in the U.S. have already been abandoned because of desertification and depletion of groundwater. The most productive marine fisheries have been depleted or become dead zones as a result of pollution. Even if resource depletion and pollution do not catch up with us in our lifetimes, how will future generations judge our current attitudes toward sustainability of Earth's resources? Love for our own children and grandchildren should demand that we take responsibility for protecting our common environment for the sake of future generations. "Many people ignore or deny human responsibility for global changes or the grim consequences of a biosphere that will no longer be capable of supporting human society. Others believe that technology will protect us from such a grim future. However, the legacy of our technological fixes is much like the story of the woman who swallowed a fly, then swallowed a spider to eat the fly, and so on until she swallowed a horse. That story did not end well, either. Even if technological fixes become available, we may not be able to afford the growing cost of fixes. For example, as human-induced global warming pushes temperature zones toward the poles, will we be able to afford the costs of relocating farms and preparing previously uncultivated land at the rate necessary to replace lost agricultural areas at latitudes with less land area? Unfortunately, in this 'take from the poor and give to the rich' political environment, corporations are more likely to win and the environment to lose unless we collectively demand approaches described in this book. "Sustainability And The Rights Of Nature: An Introduction may be Chris Maser's most ambitious work. In collaboration with environmental advocate, Cameron La Follette, who has a law degree, the book makes an impassioned and compelling case for the premise that humankind cannot flourish, or perhaps even survive, unless we recognize the primacy of the natural world within which our produced world of goods and artifacts is embedded. "Since the dawning of the Industrial Age, human beings and institutions have held the belief that economic growth and acts of production for use by Homo sapiens must come first over the 'Rights of Nature.' We have assumed far too long that the natural endowments of this wonderful planet could be permanently extracted and transformed to our material benefit. Nothing could be further from the truth. Through persuasive examples and case studies, the authors convincingly demonstrate that the rights and biological integrity of the natural world must be afforded the primacy they deserve if our produced systems are to permanently support human activity. We have no 'economic' resource base other than the environment of the natural world. "Cameron La Follette contributes the vital legal background that allows the book to demonstrate that the task of elevating the 'Rights of Nature' must ultimately be a clear-eyed and practical task that recruits our formal legal systems to the effort. The 'Rights of Nature' must be officially recognized on a plane that at least equals the level of the rights of more innately mundane human institutions and artifacts. In these litigious times, nature must be afforded the practical tools available to industrialized technological society. The task we face is one of raising human awareness about our real and inescapable place on the planet, and it becomes an exercise in regaining the humility lost in the shallow euphoria of the fossil-fuel based Industrial Age. We have a long ways to go in that task, but no journey could be more important, since it involves our very survival. This rich and carefully crafted work makes an impressive and ultimately optimistic contribution to the creation of a humble, but satisfying, human presence on our one and only home planet." "Cameron La Follett and Chris Maser's book, Sustainability and the Rights of Nature: An Introduction, is a timely and essential portrayal of our natural environment as infinitely more than a resource from which societies can continually draw. Nature's Laws of Reciprocity are boldly presented, as critical tenets for Nature to sustain the global ecosystem, depicting sustainability as a healthy relationship achieved only by thinking systemically and including Nature as the major stakeholder in societal decision-making. The authors present comprehensive, thought provoking, and compelling arguments for certain inalienable rights to be given to Nature, presenting Bolivia and Ecuador as world leaders embracing a 'Rights of Nature' paradigm in their National Laws. Sustainability and the Rights of Nature addresses the one common problem facing all nations, in a well-developed, enlightening format adaptable to all levels of governance, including the individual. La Follett and Maser are to be congratulated on this engaging and richly detailed contribution toward understanding a complex issue and introducing an actionable framework for developing a shared vision." "We can no longer sit back and expect change to happen. As the living citizens of Earth, it is our duty to protect our home planet for our posterity and for all living creatures. Cameron La Follette and Chris Maser's thinking can complement a public trust approach in the campaign for stewardship, not destruction, of our Earth. A rights of nature approach can lead society towards a new ethic, one calling for restraint and harmony with the natural world we rely on—so that all species, not just humans, can flourish."